I’ve always suspected that there was a disproportionately high percentage of genius among the readers of this blog. 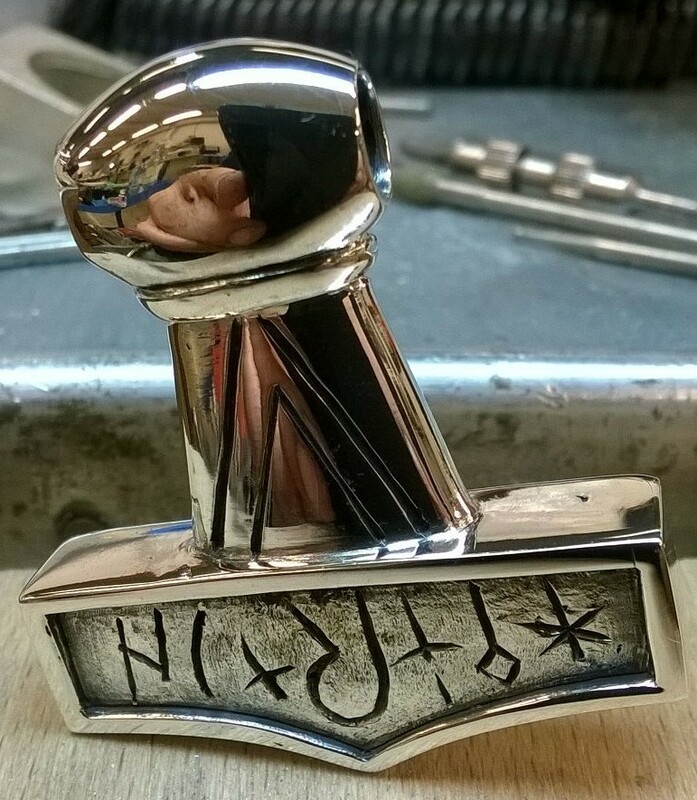 This has now been confirmed with the irrefutable finality of Thor’s hammer. 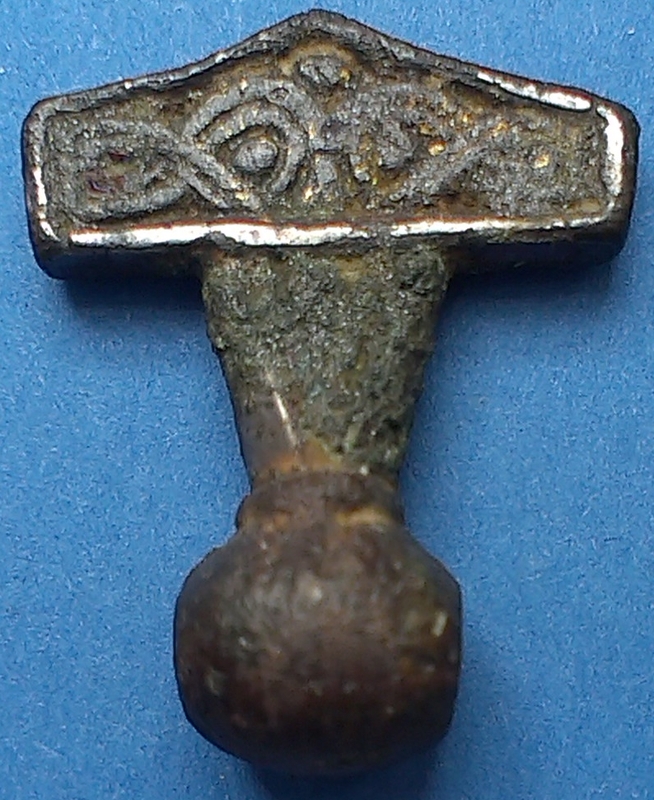 There are more elaborately decorated Thor’s hammer amulets, like this gold-plated one found in Ödeshög, Sweden, or this one found in Skåne, both now in the Swedish History Museum, but the plainer Lolland hammer is the only one ever found with runes inscribed on it. The fancier ones are as popular today as they were in the 10th century. Pages and pages of search results return links to commercial copies from companies specializing in replicas of historical artifacts to Etsy shops. 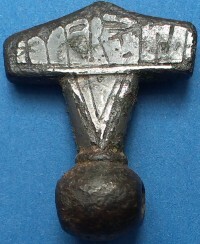 The Lolland hammer, being a much more recent find, is less extensively duplicated, although at least one outfit wasted no time in creating replicas for sale. It also happens to copy my blog entry word for word and picture for picture. 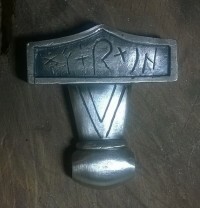 So when regular commenter Lory posted yesterday that he had made his own replica of the Lolland rune hammer, naturally I wanted to see the results of his endeavors. The pictures he sent me so impressed me that I asked if I could post them in a dedicated blog entry. Lorenzo agreed. Here they are on the right next to the original on the left. 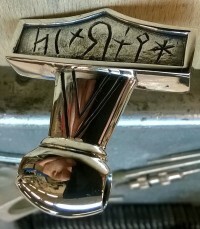 The original amulet was cast in bronze and only has traces remaining of silver or tin plating and a tiny smidge of gold plating. 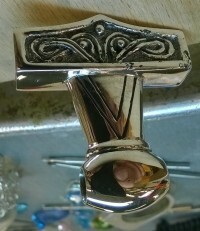 Lorenzo, as you see, made his version entirely out of silver. He agreed to answer a few questions about his work. I first asked if he was a professional jeweler or silversmith or if this was a hobby. The answer astounded me. Not only is he not a professional silversmith, but this was his first attempt at making anything like this. He learned how from YouTube! I like bricolage like an hobby in my free time. 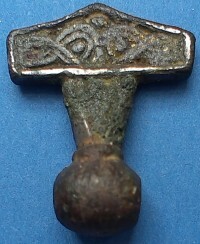 I saw that hammers around the neck of many people during a summer trip in Denmark riding my old motorcycle. 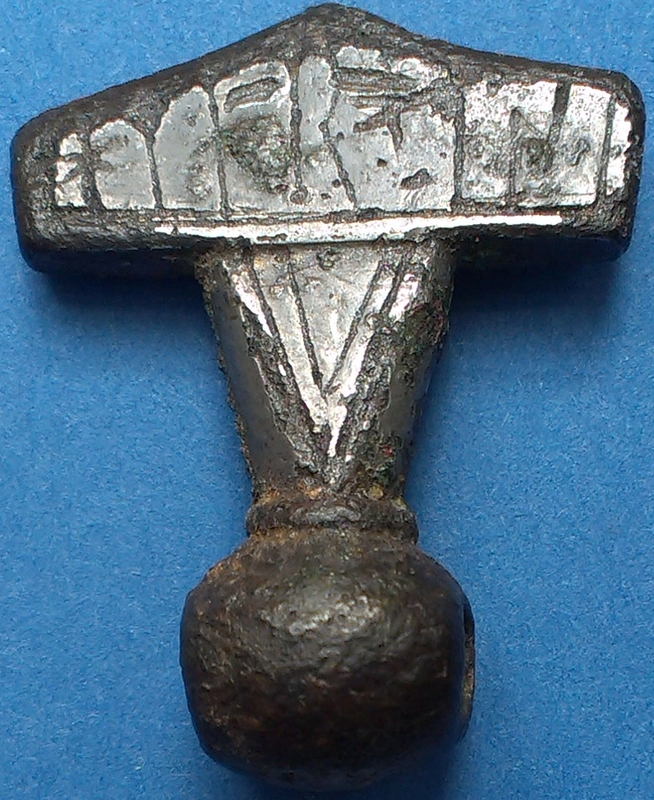 They said me that that hammer (mjölner, in danish language) is like an amulet in that place. 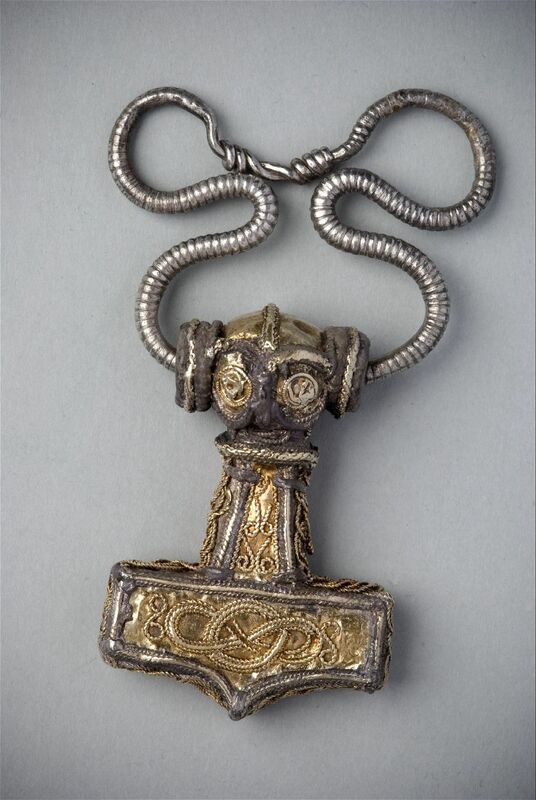 And so, when I came back to home in Italy, I’ve decided to buy a mjölner for my neck too, but looking on the net, I saw the Lolland one in Copenaghen Museum and I loved it. I strongly wanted it and so, I decided to make my silver copy. I’ve learned the mergering system from the net (Youtube is a good teacher). I bought special wax (more hard than normal) for the maquette, and some instruments to model it like the original one. The size isn’t the same, because I don’t know the real one, and there are some little differences too, because I’m not a professional jeweller. The silver comes from some little tea spoons that I’ve stolen [from] my mother. Is that not the greatest thing ever? I think we can all agree that his mother’s tea spoons gave their lives for a noble cause. After the wax model, I’ve made a negative copy of it in a big cuttlefish bone bought in a special shop. If you look on the net, you’ll see that the mergering method is very simple and fast. Jewelers prepare cuttlebone for use as a mold by cutting it in half and rubbing the two sides together until they fit flush against one another. 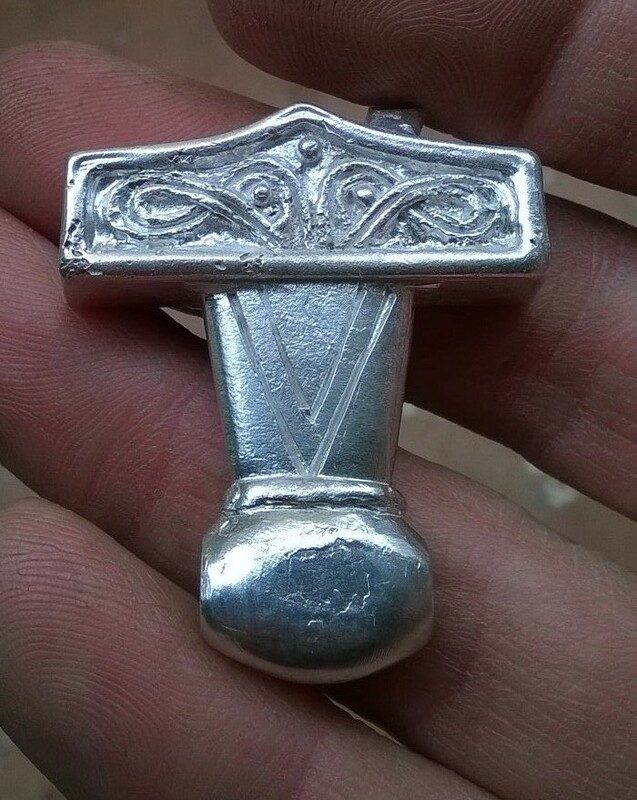 Then the casting can be done by carving a design into the cuttlebone, adding the necessary sprue, melting the metal in a separate pouring crucible, and pouring the molten metal into the mold through the sprue. 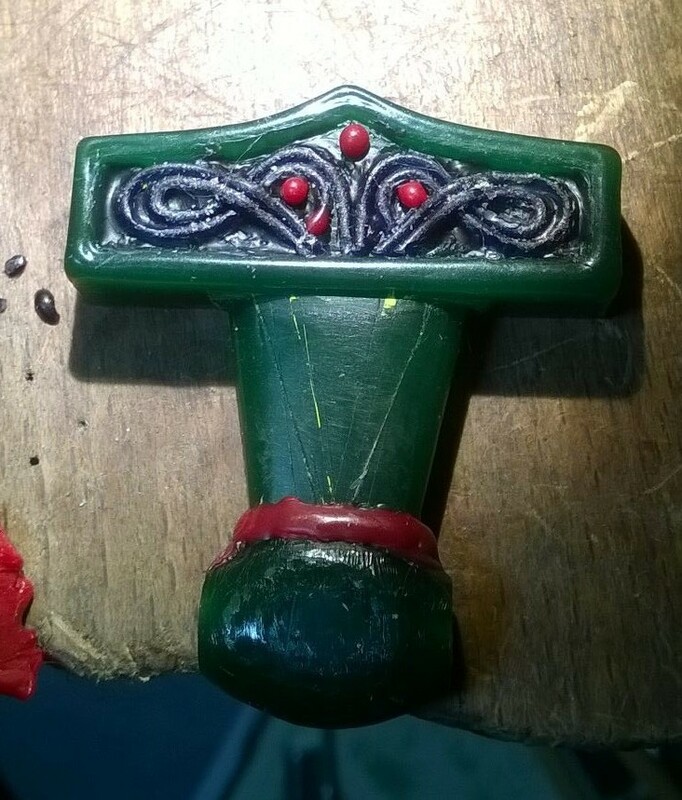 Finally, the sprue is sawed off and the finished piece is polished. Which is just what Lorenzo did. After the mergering, with a soldering butane blowpipe and a ceramic melting pot, I’ve used three different paste and a little circular instruments with my little drill to eliminate some mergering imperfections and make it shining like you can see in the last two pics. For the necklace Lorenzo plans “a strong leather cord with beautiful old style clasps.” I’m sure it will look smashing. This entry was posted on Tuesday, December 1st, 2015 at 4:20 AM	and is filed under Medieval, Modern(ish). You can follow any responses to this entry through the RSS 2.0 feed. You can skip to the end and leave a response. Pinging is currently not allowed. Great work, Lorenzo. Brilliant to see what the amulet would have looked like when new. 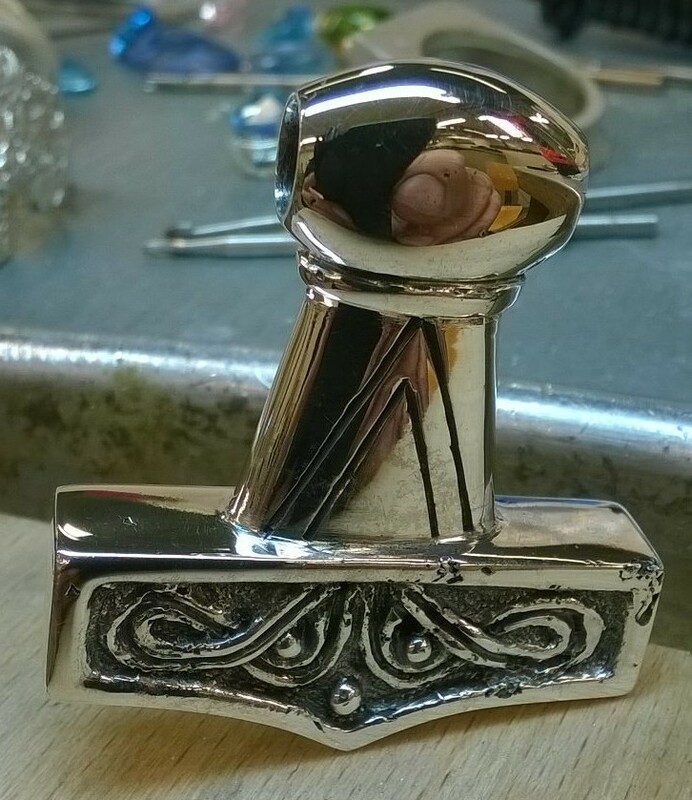 Great work indeed, even if I never meant to ‘thormint’ moms kitchen equipment and melt down her inherited nickel silver cutlery, which btw contains usually 60% copper, 20% nickel and 20% zinc and no elemental silver unless plated. I could not tell if the Vikings ever used cuttlefish bones, but I saw plenty of that stuff on the beaches west of Calais in northern France, all of them about the size of a large foot. Also, I am not sure if I properly understood the step from the wax model to the sepia casting negative. The cuttlefish bone would be not soft enough for an ‘imprinted’ casting negative, would it ? The combination wax/clay, for instance, makes sense to me. This man is brilliant, superb craftsmanship. He would be excellent at reproducing for Museums. He could make a very nice and interesting little business for himself. Wow. Just wow. Lorenzo’s mother’s spoons must have been sterling. Grazie, mamma! This is amazing. I am completely plotzed. You know I love this weblog and right now, this is my favorite entry for this year. Love this and agree he is an artist and needs to do this for a living. PS. 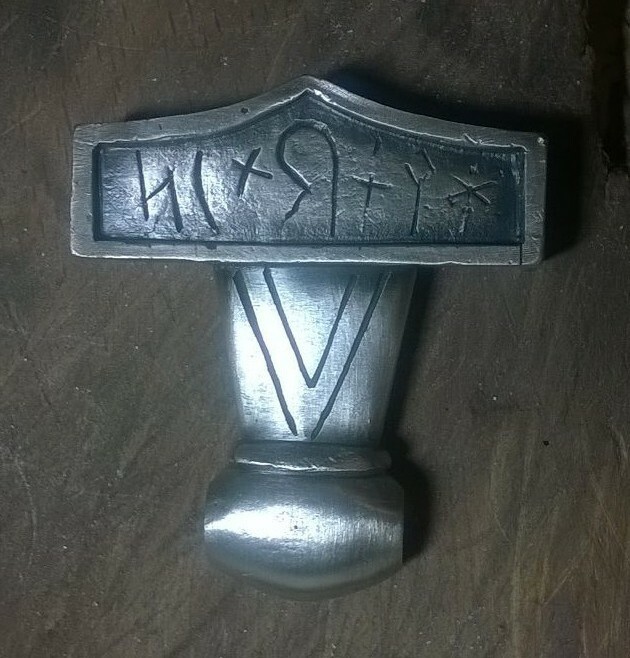 The tea spoons of my mother were in Silver 925, as was engraved on. Better a silver hammar around the neck than a silver spoon in the mouth. This is a super favorite blog of mine and i find it very inspiring, also! Wow. Lorenzo’s reproduction is quite stunning. I am SO impressed. Yes, like Rita, I wonder if he might have stumbled into a possible vocation! Fabulous! 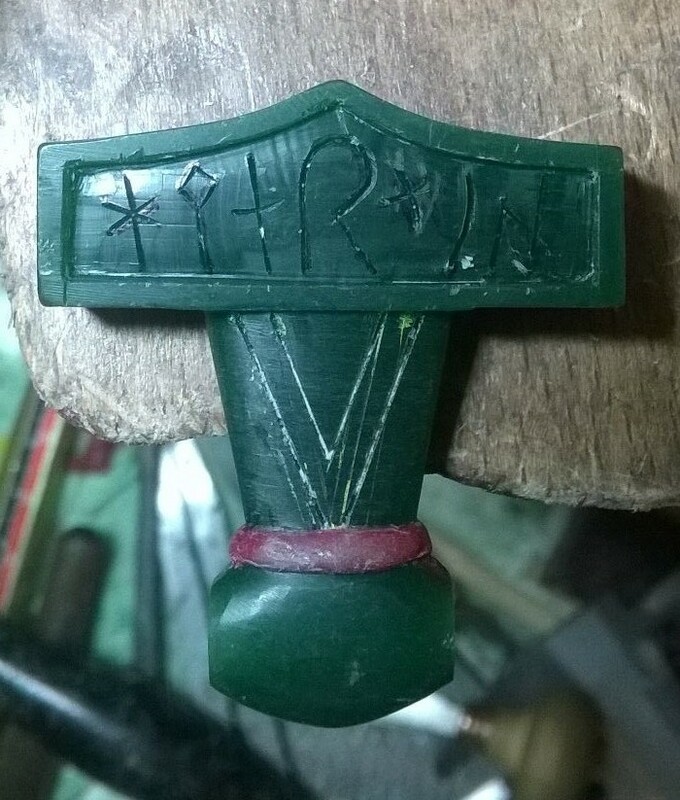 I wish I could have Lory make one for my husband, Arhtur, who has always believed his name derives from the Scandinavian god Thor! A beautiful piece of work! You can try the lost wax casting method, using plaster of Paris . It does destroy your model but it’s easy for one off casting. Hi Ermione :)If “925” number is engraved on it, the spoons are absolutely in silver. Or if you want, you can buy silver in special shop. In Italy costs € 2.00/2.50 for one gram. Really beautifully done. I am inspired by the entire story, including Prague!